Keep your flammable liquids safe and secure. 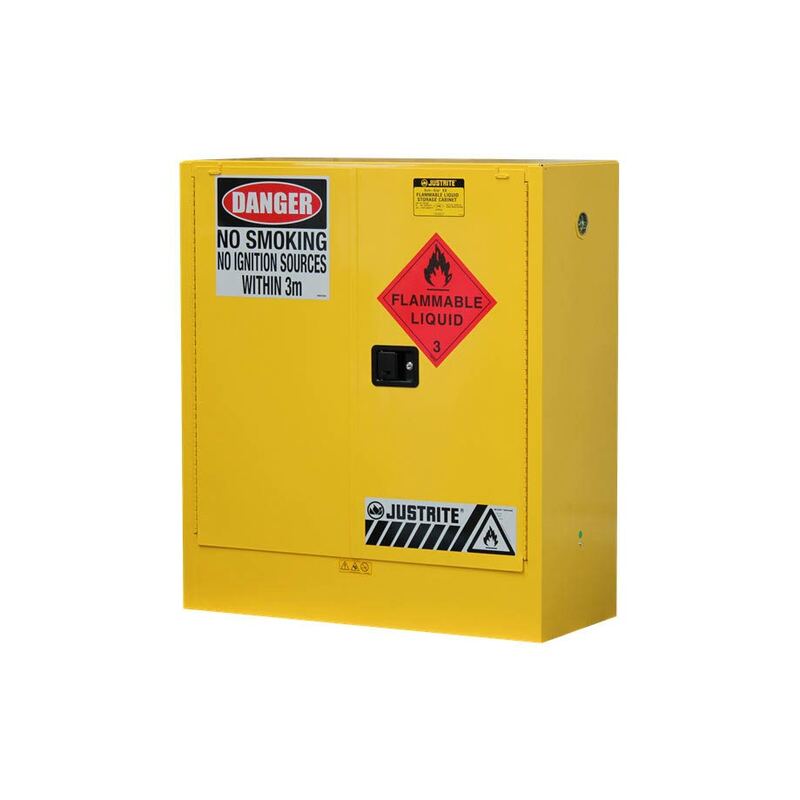 Our flammable safety cabinets are a secure and cost-effective solution for safely storing a wide range of flammable and combustible liquids, as classified by the United Nations criteria and the ADG Code for Dangerous Goods. This includes paints, solvents, petrol, kerosene, thinners, turpentine, white spirits, alcohol and ethanol. It also includes combustible liquids such as diesel, pine oil and linseed oil. Available in a variety of styles, sizes and colours, our range of flammable material safety storage cabinets help protect flammable liquids from ignition sources and ensure you tick off the compliance requirements. Check out our range of small flammable safety storage cabinets that store 30 litres to large flammable storage cabinets with a capacity of 350 litres. We also have a range of handy under bench flammable storage cabinets. Each of our flammable storage cabinets complies with the Australian Standard AS 1940 “The Storage and Handling of Flammable and Combustible Liquids”. They are also approved by global safety company FM Approvals, giving you the extra peace of mind that they comply with the most stringent safety regulations and quality standards for flammable liquid storage. For example, in the event of a spill inside the cabinet, all flammable storage cabinets incorporate a leakproof fully welded 150mm deep containment sump. Why do I need a flammable storage cabinet? The improper storage of flammable or combustible materials can be a source of fires and explosions in the workplace. It’s your responsibility, and obligation, to take proactive measures to prevent an accident. This begins by using the correct flammable liquid storage cabinet. 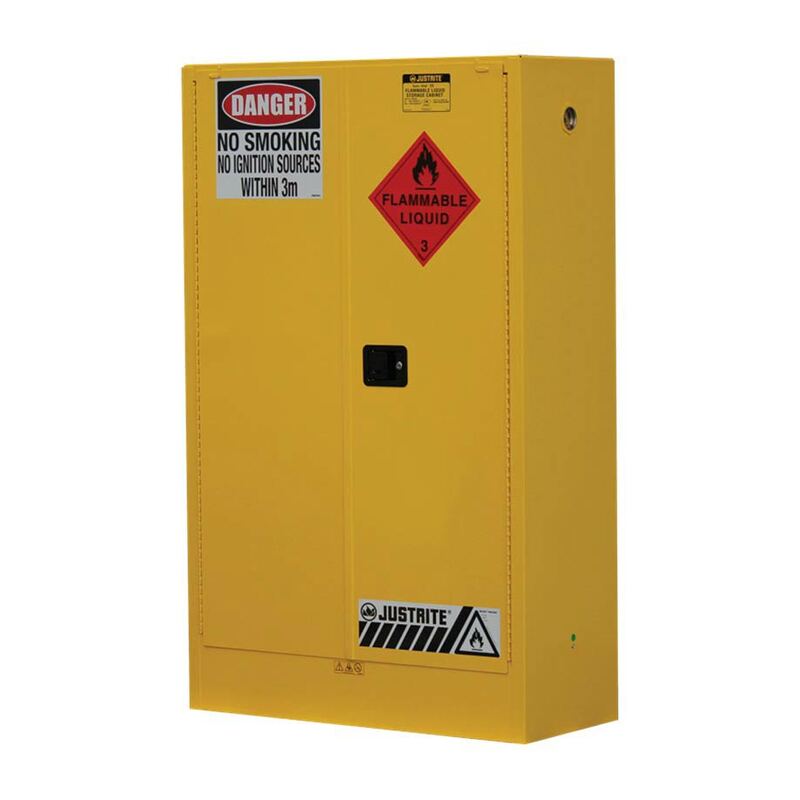 Choosing the right flammable safety storage cabinet will help protect your employees, your business, your reputation, and your bottom line. Do your fireproof storage cabinets ensure full regulatory compliance? Yes. Not only can you buy a heavy duty flammable storage cabinet, you can be sure they are compliant with all the relevant standards. Our range of flammable liquids cabinets comply with the Australian Standard AS 1940 "The Storage and Handling of Flammable and Combustible Liquids". They are also approved by an international leader in third-party testing and certification services. FM Approvals uses scientific research and testing to test property-loss-prevention products (such as flammable substance safety storage cabinets) that are used in commercial and industrial facilities. For you, it provides peace of mind that our flammable substances safety storage cabinets will store your flammables safely. What types of materials should be stored in these cabinets? Even if you don’t use flammable liquids as part of your manufacturing process, you will commonly have small amounts of these fluids for machinery or facility maintenance purposes. But how do you store these? 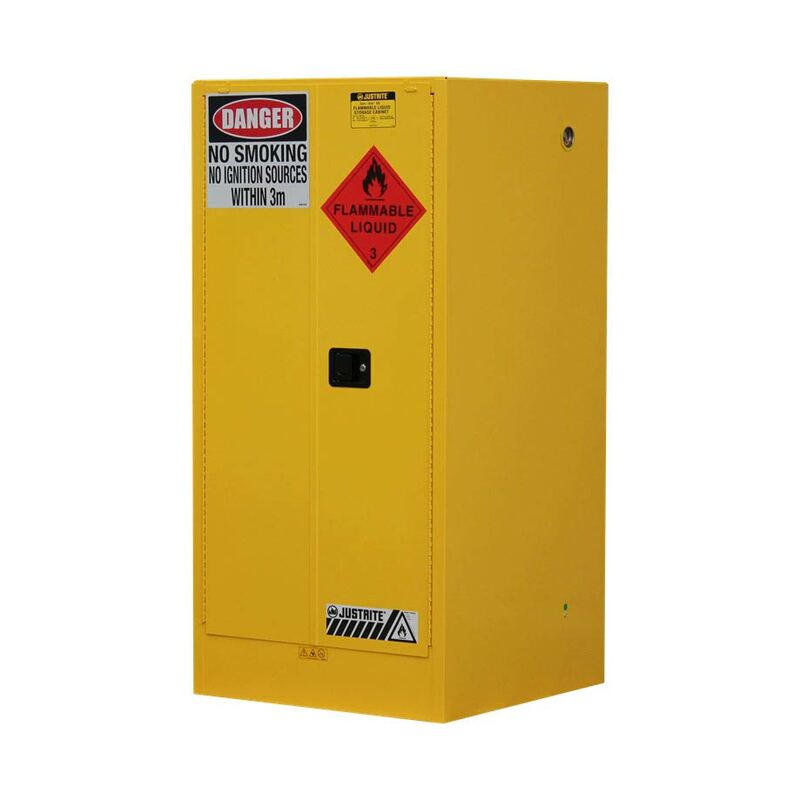 Our flammable materials safety storage cabinets are designed to store flammable or combustible liquids as classified by the United Nations criteria and the ADG Code for Dangerous Goods. This includes flammables such as paints, solvents, petrol, thinners, kerosene, turpentine, white spirits, alcohol and ethanol. It also includes combustible liquids, including diesel, linseed oil and pine oil. What types of materials SHOULD NOT be stored in these cabinets? Do not use flammable storage cabinets to store pressurised gas cylinders or aerosols. Not even our heavy duty flammable safety storage cabinets. Instead, use our specialised gas and aerosol cages. Do you supply outdoor flammable storage cabinets? Yes. As well as small and large flammable storage cabinets, you can buy cabinets designed specifically for outdoor use. Our outdoor flammable safety storage cabinets are finished with a weather-resistant coating to withstand exposure to the elements. At iQSafety, we’re proud to offer the highest quality flammable safety cabinets to businesses around the country. Wherever you’re based - including Melbourne, Sydney, Canberra, Brisbane, Darwin, Perth, Adelaide, Hobart and everywhere in-between - we’re confident we have the spill kits and absorbent products to ensure you’re prepared for any situation.